The most trending bridal jewellery combination- Mix n' Match is the way to go! Wearing a combination of contrasting coloured Lehenga and jewellery is probably the best option to go for. Not only are they different from the mainstream trends but also make your beautiful bridal outfit and jewellery stand separately. The kundan jewellery along with beautiful contrasting beads of this bridal duo gives a clear idea of how to play with colours in a classy way. Yet another example of a Kundan jewellery embedded with emerald green beads. Loved the combination over this beautiful red lehenga of the bride. Beautiful traditional choker necklace with green beads is the bridal jewellery this beautiful bride opted for. Picture perfect! The regular trends are good, but doing something Hattke is what that creates a buzz. Take a look. Remember the much talked about headgear that Sonam Kapoor wore for her grand day? Well it’s perfect if you can carry it off. Stand a step ahead in the trend line with the option of mix n’ match. We spotted the most unique combination of traditional jewellery paired with tribal jewellery in this wedding. Let your hands do all the talking! Statement kangans paired with traditional hath-phool is something to go for a Hattke option. Sometimes, it’s best to not overdo it and keep things simple! Check out the most minimalistic yet gorgeous wedding jewellery we spotted on real brides. 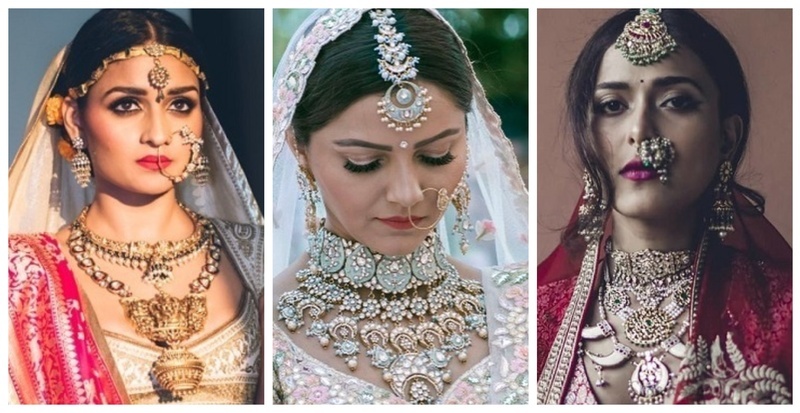 Well, if you are not someone who wants to go the minimalistic way, then here are the perfect jewellery combinations for your wedding. The Royal look of these picture perfect brides would definitely be the right way to go. This utterly beautiful bride brought the best of Punjabi & South Indian styles in her bridal look. She wore a heavy jewellery set with a silk saree and we just can’t take our eyes off her. Mesmerized with the way she smiles, covered under this contrasting pair of royal jewellery. So, have you made up your mind on your bridal jewellery?